Time is running out for non-profit groups hoping to take charge of non-NASA experiments on the U.S. part of the International Space Station. NASA has been seeking proposals from non-profit organizations interested in managing space station science since December, but the deadline for applicants to notify NASA of their intent to apply is now less than two weeks away, agency officials said today (Feb. 22). Competitors must file notice-of-intent letters by March 4 stating that they plan to submit a proposal, while proposals themselves are due April 1. NASA hopes to make a decision by May 31. "We think we're going to see a fairly robust competitive field," said Mark Uhran, NASA's assistant associate administrator for the International Space Station. NASA hopes an outside entity will help utilize the station's full research potential and encourage private industry, universities and other governmental organizations to pursue research on the orbiting laboratory. Construction of the International Space Station began in 1998 and is due to be completed this year. The project is a cooperative effort by 15 countries working under five international agencies (NASA, the Russian Federal Space Agency, the European Space Agency, the Japan Aerospace Exploration Agency and the Canadian Space Agency). As of November 2010, humans have been continuously occupying the station for more than 10 years. The U.S. portion of the outpost was designated a National Laboratory in 2005 to open its facilities for use by non-NASA researchers. Since then, the station has already hosted outside research projects, but NASA hopes those will pick up once the non-profit is established. 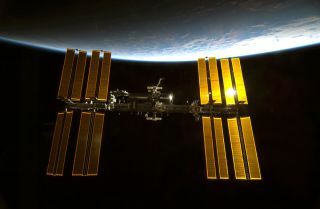 The plan to turn over management of U.S. external research to an independent non-profit has been in place since the space station's early planning stages, Uhran said. "The vision was that we were building the space station not solely for NASA uses, but also for uses by the nation," Uhran said during a Tuesday press conference. "We're trying to expand the other uses besides NASA." Once the non-profit is set up, it will review research proposals by universities and companies looking to conduct studies on the station. NASA would cover the costs of launching experiments to space, and would even contribute some crew members' time to carry out the experiments, if needed. "We see potential in science, engineering, commercial development," Uhran said. "I'm very bullish on the productivity potential of the space station, and this is going to be an important step in making sure that productivity is realized."